Served from opening until 4 p.m. Carrot butter, pickled onion, chive, olive oil, soft-boiled turmeric pickled egg, feta, toasted five-seed bread. Served with a side salad. Coconut rose chia, roasted persimmon, pomegranate, citrus, house granola. Overnight steel cut oats, dates, tahini, cherry compote, brown sugar, coconut butter, fleur de sel. Two soft-boiled turmeric pickled eggs OR avocado, local greens, black eyed peas, brown rice, roasted seasonal vegetables, pickled onions, toasted five-seed bread, carrot butter, chives, lemon vinaigrette. Add salmon 5. Many items can be made vegan and GLUTEN-FREE upon request. Yay! Consuming raw or undercooked meats, poultry, sea food, shellfish or eggs may increase your risk of food-borne illness. Please inform us of any food allergies. Served from 11 a.m. to 4 p.m.
Chickpeas sautéed with curry spices, Jimmy Nordello peppers & turnip greens, quinoa, avocado, pickled turnip, greens, sherry vinaigrette. Add wild caught salmon 5. Turmeric hummus, flaked salmon, pickled celery hearts, fennel pollen, smoked salt, pea shoots, toasted five-seed bread. Served with a side salad. Roasted cauliflower, kale & toasted sesame pesto, pickled fennel, caramelized onion, carrot butter, greens, five-seed bread. Served with a side salad or cup of soup. Turmeric hummus, onion jam, roasted beet, roasted sweet potato, pickled onion, feta, greens, five-seed bread. Served with a side salad or cup of soup. Chickpea mash OR roasted chicken, promontory cheddar, cilantro, apple slaw, chipotle aioli, cranberry jam, five-seed bread. Served with a side salad or cup of soup. Served weekends from opening until 4 p.m.
Herbed biscuit, vegetarian fennel gravy, soft-boiled turmeric pickled egg, roasted vegetables. Brewed to order. See printed single-origin coffee list for this week's selections. Hojicha, candy cap mushroom, turbinado sugar, salted cacao bitters (contains almonds), steamed milk, nutmeg. Yerba mate, roasted butternut squash, brown sugar, cinnamon, blackstrap bitters, steamed milk. Cranberries, rosehip and hibiscus tea, clove, star anise, cinnamon, rosewater, orange blossom water, orange bitters. Black tea, rose petals, clove and star anise, rosewater, milk. Cream Earl Grey tea, lavender petals, lavender bitters, milk. Assam black tea, whole spices, fresh ginger, cardamom bitters, milk. Indigenous prosecco, grapefruit, blood orange, star anise, cinnamon, Crybaby fruit punch bitters. Indigenous prosecco, orange, passionfruit, guava, nutmeg, Crybaby bay leaf bitters, raspberry dust. See printed menu for current tea selections. If you'd like a whole batch of our baked goods, a custom cake, or a large take-out order for lunch, we can probably accommodate you with 48 hours notice. Fill out the inquiry form below and we'll let you know ASAP. 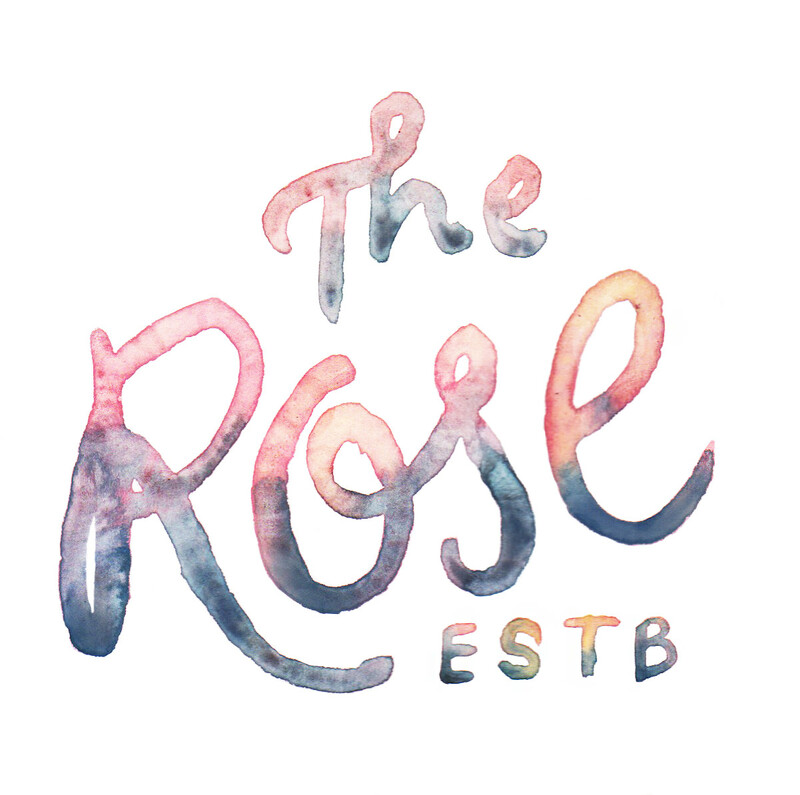 The Rose makes a really nice venue for parties and weddings. If you'd like to rent the place, Download our brochure.